I decided I was sick of not feeling well, so I did something about it. After getting the help and support I needed to be successful, I started my real fitness and postpartum recovery in February of 2017, right after my youngest daughter’s first birthday. FEBRUARY: This was the month that I started eating healthier. My portion sizes were huge in comparison to what they were in the past. I subscribed to an organic meal delivery service where the portion sizes were much smaller. The first couple meals I ate had me worried because I was so hungry afterwards, but I was able to get used to food very quickly. Although I only stayed with this company for a couple months, it was enough to get my family and me cooking and eating less for dinner. This had a snowball effect, and I cut out my habit of going out to eat for lunch, grabbing sweets at the gas station, and drinking soda. All-in-all, I lost 8 lbs within three weeks during the month of February, and it was all because of food. I should also mention that I started saving $80+ per month, and minor abdominal pains that I had been experiencing for the past year slowly went away throughout the month. 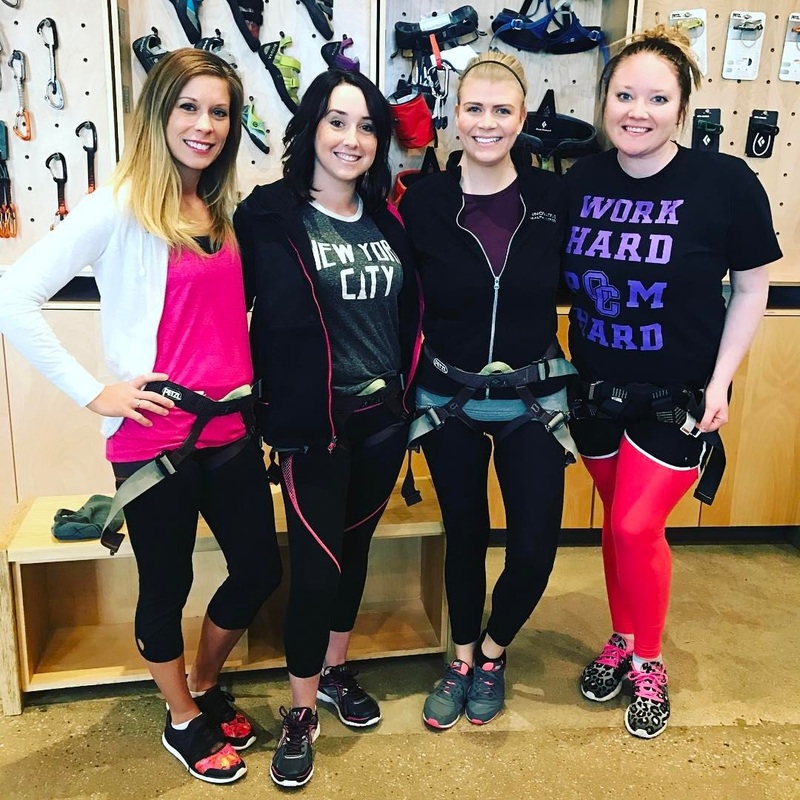 I celebrated my February birthday with friends at the rock climbing gym. This was the exact week I started eating healthier. MARCH: I started hot yoga again in March. A friend invited me, and this is the only yoga studio in my town that offers hot yoga. This new hot yoga studio is not the same as Bikram. I used to diligently practice Bikram roughly 5 years ago, but I worked in a factory for a summer, and it was during that time that I lost my consistent Bikram practice. Yoga has improved my balance, posture, flexibility, muscle tone, and general attitude towards life. I can’t believe I ever stopped this important ritual, but I’m happy to be back on track. I now attend classes twice per week. In March, I lost 4-5 lbs. APRIL: I started to really feel the results of my healthier habits in April, and I made some future travel plans. I maintained my workout schedule, and I brought a team together to play summer volleyball with me. It was a great month! By maintaining my healthy habits, I lost 3-5 lbs. MAY: May is one of my favorite months of the year. In March I tend to find hope--there’s light at the end of the tunnel because winter is almost over--but May is special. It’s warmer, sunnier, and summer is just around the corner. This summer I decided to visit a good friend. She’s temporarily living in California, so she and a group of her closest friends (who are also old friends of mine) provided me with great hospitality. I traveled alone for a long weekend trip, and I’m happy to have gone. I gracefully conquered my fear of heights, and I pushed myself to travel solo and be as self-sufficient as possible because I have horrible travel anxiety. They took me rock climbing, and I saw the ocean. In May, I lost 3-5 lbs. I started feeling great in May. I like to flex my arm muscles, and I realize in the future I should consider more diverse poses! The month of June, I lost 5-8 lbs. July is when I hit my pre-pregnancy weight, but most importantly I am much stronger and healthier than I was before. I've been more active on my Instagram account, and I’ve been posting some photos of my progress. That being said, I think it’s important to show other women that postpartum recovery lasts far beyond what many Americans believe. It takes time to heal, motivation to start working hard, and an amazing amount of support and willpower to simply take care of oneself again. It’s not easy, so I hope to maintain this momentum while encouraging a few other women--especially mothers--along the way.